Pages 22-23 — Is it Aunt Root’s cooking, or the swaying of the hammock? What a dream! 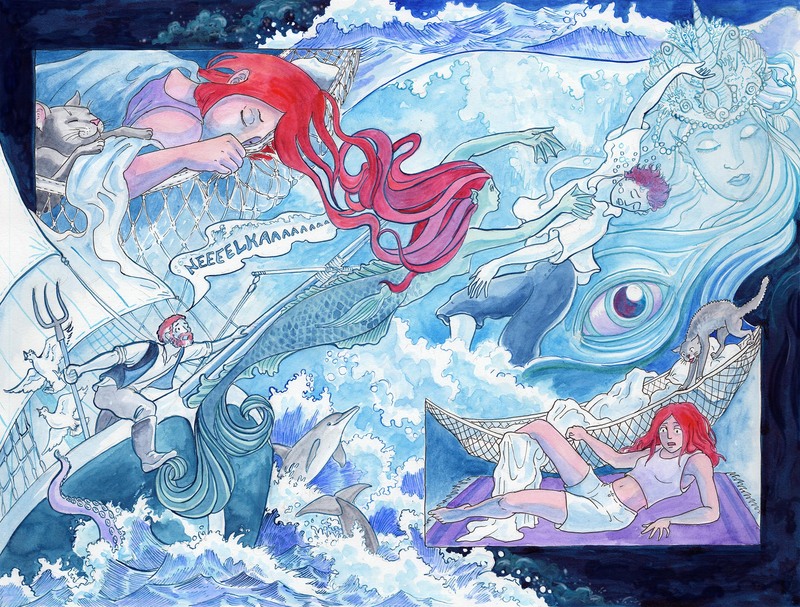 This comic was posted in Mermaid Music and tagged cat, comic, dolphins, dream, graphic novel, Karen Gillmore, mermaid, mermaid comic, mystery, sailors, sea comic, ship, storm, watercolour, webcomic. Thank you! I’ve never drawn a dream of a fictional character before, so glad to know it’s working! Well, it looks perfect to me. I love how all the elements blend into one another… Really beautiful. And I love the color work, too. As it happens, I had a doozy of a dream this morning that is going to merit its own comic, I think! Hooray for getting to sleep in!